Does It Matter That Cameron’s New Attorney General Isn’t a QC? Scott makes a trenchant argument that Wright might not be the right man for the job (*rimshot*). Unlike his predecessors, Wright has not taken Silk (i.e. been appointed as Queen’s Counsel). It might be tempting to dismiss this as an antiquarian curiosity, but I think it’s actually quite significant. The title of Queen’s Counsel is awarded to recognize excellent advocacy. Appointments are based on merit (candidates are chosen by an independent panel of legal experts and laypeople), so it’s safe to assume that, if someone has the letters QC after their name, they’re a darn good lawyer. Given the complex nature of the Attorney General’s job, it seems logical that someone from the creme de la creme of the legal profession should be appointed. Obviously, there are talented lawyers who aren’t QCs, but it’s not clear that Wright is one of them. His profile on his chambers’ website makes for quick reading and suggests a barrister of limited experience. His political resume is similarly slender. He was a Tory whip from 2007 until 2012, and then he became a Parliamentary Under-Secretary of State in the Ministry of Justice (Parliamentary Under-Secretaries of State are at the bottom of the ministerial hierarchy). 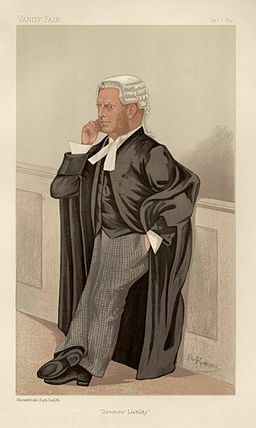 By way of comparison, Lord Williams of Mostyn (Attorney General under Tony Blair) served as a Recorder, a Deputy High Court Judge, and the Chairman of the Bar Council before he entered Parliament. Similarly, Lord Rawlinson of Ewell (Solicitor General under Harold Macmillan and Attorney General under Edward Heath) had a judicial career that included stints as a Recorder, and he defended the Daily Express in the D-Notice affair. They certainly seem to put poor Wright in the shade. Another issue is that, like the Lord Chancellor, the Attorney General is traditionally expected to keep a certain distance from his colleagues. He or she must be prepared to give sound, unbiased legal advice, no matter how unpalatable it might be. I share Scott’s concern that Wright might not have the auctoritas et gravitas to carry out this vital function. I hope I’m wrong about Wright, and he’s just exceptionally good at hiding his light under a bushel. Only time will tell. This entry was posted in British Constitution and tagged David Cameron, HM Attorney General, Jeremy Wright, Law Officers, Ministers of the Crown. Bookmark the permalink.